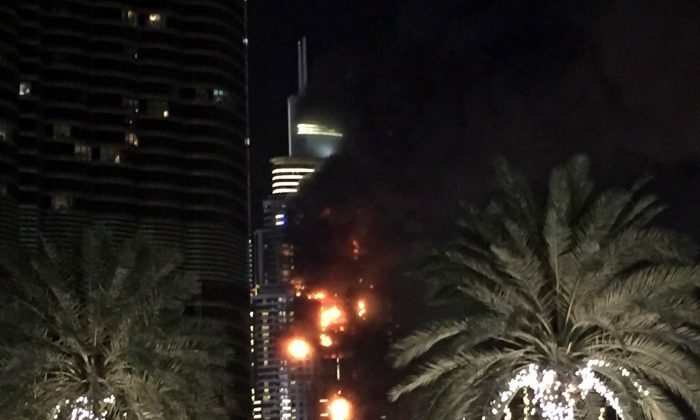 A hotel in Dubai has caught on fire, and it has engulfed at least 20 stories. The Address Hotel, located near the Burj Khalifa–the world’s tallest building–caught on fire just two hours before midnight on New Year’s Eve. UAE’s police chief said it was successfully evacuated and there were only light injuries, Reuters reported. Burning debris from the building was raining down as firetrucks raced to the scene. Numerous and photos captured the blaze, and they were uploaded to social media. “A fire has been reported in the Address Downtown hotel. Authorities are currently on-site to address the incident swiftly and safely #Dubai,'” the hotel chain retweeted. The account said the fire erupted on the 20th floor. The cause of the blaze is currently unknown. The hotel is located next to Dubai’s fireworks celebration for the New Year. However, no fireworks had been set off, the Independent reported. “It just spread very rapidly, I’d say within six or seven minutes, the entire side of the building was just engulfed in flames,” Margaret Besheer, an American vacationing in Dubai, told NBC News. The New Year celebrations were slated to start two hours right before the fire erupted. The Address Hotel is among the tallest skyscrapers in Dubai at 991 feet. It has 196 apartments and more than 600 rooms. There’s also a Wolfgang Puck restaurant in the building. This is a developing story. Please refresh for more updates.